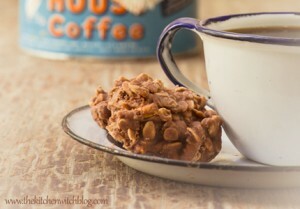 Check out this great idea for no-bake cookies, thanks to our Featured Foodie, thekitchenwitchblog.com. No oven required! In a large sauce pot over medium high heat, bring sugar, milk, butter and salt to a boil. Boil for 1 minute. Remove from heat, add Nutella and vanilla, stir until smooth. Fold in oats and pretzels. Let cool enough that the mixture starts holding together, about 3 minutes. Drop onto wax paper lined baking sheets. Let cool completely.